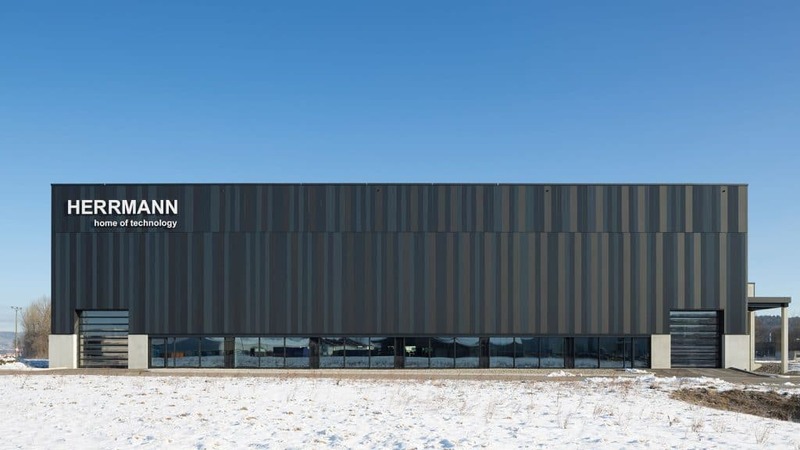 The new Herrmann production hall, which went into operation at the end of 2017, can be classified briefly and aptly in terms of geometry, asceticism in the use of materials and aesthetics in its visual appearance. With its KfW 55 energy standard, the industrial building also demonstrates pioneering energy efficiency. Together with the building owners, we have integrated the complex and variable logistics chains and production processes into the building concept. It is based on permanent flexibility in terms of space and on minimizing operating and maintenance costs. The highest priority was given to a coherent, high-quality architecture, of which the Planum façade, designed with precision, plays a major role. It gives the building its unmistakable identity and is at the same time a timeless, protective and maintenance-friendly building shell. The company DOMICO from Vöcklamarkt was always a very reliable partner when implementing our design ideas. 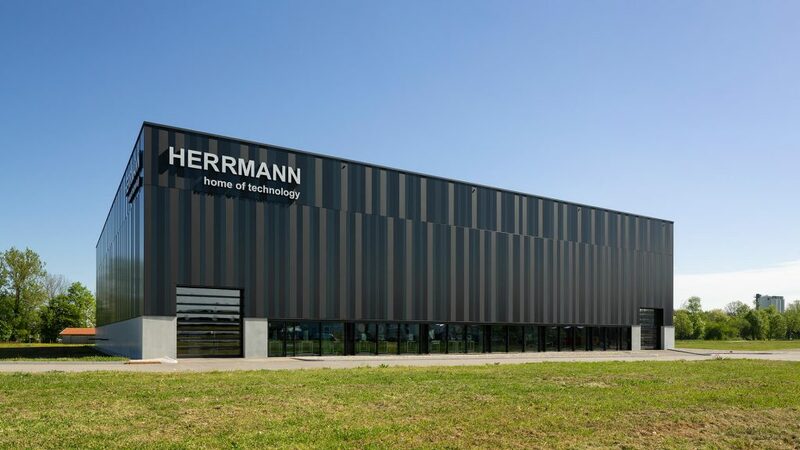 Since it was founded almost 15 years ago, the Herrmann family business, which is active in various fields of activity, has grown steadily. After always new spatial provisional arrangements, it was necessary at some point to create sufficient space in a coherent working and production environment for the now more than 100 employees. However, it was not enough just to provide adequate space. Anyone who is involved in constantly changing and changing areas of responsibility and manufactures more than 24,000 different products must also pay special attention to flexibility in the complex manufacturing processes. 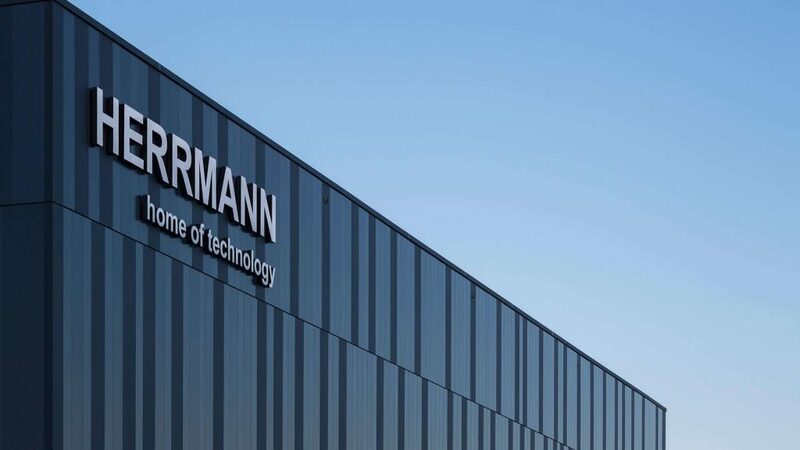 The managing partners Thomas and Ralf Herrmann therefore regard the relocation of their company to the tailor-made Leutkircher domicile not only as a positive milestone, but also as an important step on the way to a successful future for the company. For the local planners of Redle Architects, this task meant familiarizing themselves with the variable forms of production in the course of the structural concept. The constant introduction of new machines and plant components – sometimes developed by the company itself – into variable process chains, the removal or relocation of existing equipment, and always having enough space to install optimized production lines all require a large amount of space. However, this is subject to the requirement of high economic efficiency during construction and operation. Ultimately, planners and builders determined an order of magnitude for the project, whereby the joint optimization process came close to a gruelling puzzle with variables that were sometimes difficult to calculate. With its square dimensions of around 50 metres in length and width and a height of 13.5 metres, the production hall encloses an enclosed space of almost 34,000 cubic metres and, with a side building, offers a total usable area of 3,400 square metres. The entire building is dominated by the voluminous cuboid of the production hall. The architecture and use of the adjoining building, which is directly attached to the east side, is such that it will serve as an axis and joint for the later overall complex in the case of a mirror-image structural extension that has already been considered. This architectural function is already emphasised by an outer skin with puristic grey fair-faced concrete surfaces that strictly separates it from the grid hall architecture. In order not to disrupt the closed overall impression of the cube façade, the parallel building front of the extension also received a curtain wall – deliberately set off in deep dark colour, but with identical materiality, which visually signals: At this point it’s all over for now, but something will happen here later. In comparison to this design restraint, the curtain walls of the giant hall cuboid play with the product’s own variability and with the geometry of the almost closed structure. In the virtuoso alternation of raster and colour, the surfaces that appear to be small as a result take the bulk out of the large volume. At the same time, each individual façade surface and, when added together, the entire building is given its own high design quality. A horizontal tripartite division of the surfaces around the building ensures an optical reduction of the building height. This sensation is based on accentuated constrictions through horizontal joints, which in a clever composition correspond with an eye-catching vertical façade grid. This is based on an uneven striped pattern. The variation in width and colour of the panels as well as a slight lateral offset along the narrow dividing line in the upper third of the surface keep the observer’s eye so intensely in motion that the building body virtually eludes a static overall view. The base zone is defined by a light horizontal strip of fair-faced concrete about three metres high, which dissolves into a strip of windows in the access and rear façades. 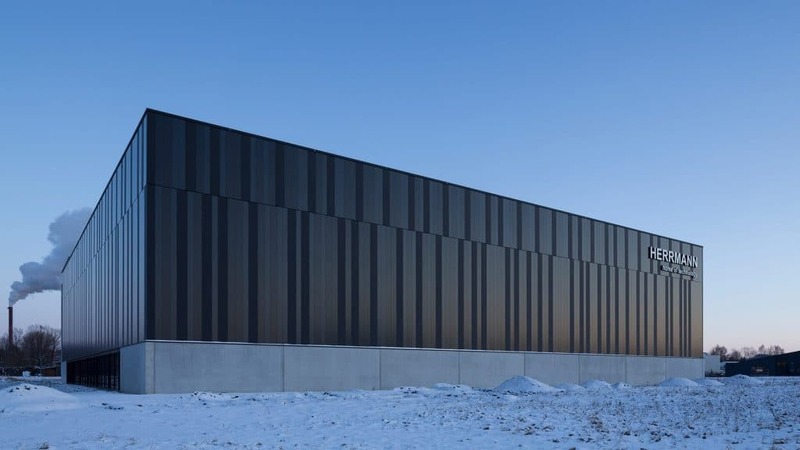 With two glass industrial roller shutters and the side structure stepped towards the front, the main façade blends very discreetly into the overall aesthetic appearance of the building complex. As a striking eye-catcher on the façade and – in a double sense – at the same time as a widely visible business card of the company’s own precision, the snow-white company logo corresponding around the southwest corner serves. In front of the dark facade background, the geometrically well-placed letters look as if they have been punched out. They “indeed” bear witness to the highest level of design accuracy, as they come from the company’s own production. This also applies to the fixing parts, which are guided through the façade without any constraints and anchored with millimetre precision. One can imagine meticulous detailed discussions between the builder, architect, facade manufacturer and assembly company in the conceptual apron, as well as heart palpitations in the laser-assisted arrangement of the cross-functional masterpiece. The new building was to be a building of lasting value, with efficient building technology and, in terms of architecture, a showpiece building both inside and out – that was the client’s demand on the architects. 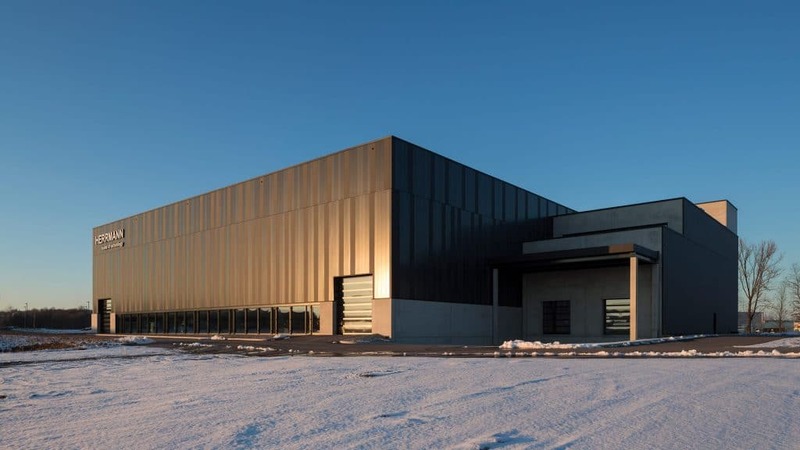 They chose a thermally insulated concrete floor slab as the basis for the total area and the robust industrial floor. A skeleton of individually clamped reinforced concrete columns forms the supporting structure, which is spanned in two sections by reinforced concrete ceiling girders. At a height of around nine metres, two gantry cranes run on consoles, which minimise the installation and transfer times of the machines when changing production lines. A steel maintenance aisle rotating at half height also serves to increase the efficiency of operational processes. DOMICO supplied a metal cassette construction with 140 mm integrated mineral fibre insulation for the outer walls of the building shell. Above the trapezoidal sheet metal support shell of the flat roof lies 220 mm thick mineral fibre insulation, to which two large-area light strips of corresponding insulation quality are connected. DOMICO supplied the outer skin of the façade with all connections and terminations to the construction site ready for installation. The substructure of the penetration-free DOMICO-Planum façade includes additional 50 mm thick mineral wool insulation to cover the cassette webs. Only a second look at the facades reveals the accurately planned arrangement of the striped patterns, which initially appear to be disorderly: the design is based on a precisely regulated sequence of only three panel widths. Each panel width was assigned a specific colour, one of which had a matt surface. In detail, the masterly composition consists of the panel widths 500 mm (RAL 7021 matt), 400 mm (RAL 7021) and 300 mm (RAL 7016). From the very beginning, Redle Architekten, the manufacturer DOMICO and the contractor Kemmler from Tübingen discussed in detail, organised and meticulously supervised the facade, which was the defining feature of the architecture. The client’s initial worries about deadlines and costs were resolved at the latest by the successful integration of their memorable business card. In terms of energy consumption, the building is designed to meet the KfW 55 standard. This achieved groundbreaking quality in industrial construction and at the same time made it possible to obtain financial support from public funds. A multi-stage controlled heat pump system was designed from the calculated production energy mix for efficient reciprocal heating and cooling via the core-activated base plate. Weiterempfehlung ist alles. 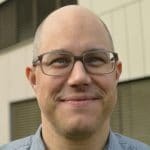 Hier erfahren Sie warum Architekten, Bauherren und Fachfirmen sich für DOMICO entschieden haben. Our technical consultants are looking forward to your inquiry! Because our products are tailor-made for your building project. This guarantees maximum design freedom and economy.